Many routes to the summit, but the shortest is the favorite: the White Dot Trail. 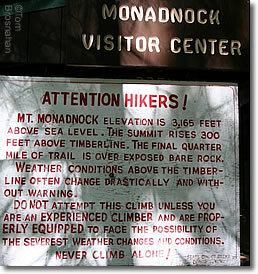 You can approach and climb Mount Monadnock from any direction—north, south, east, west—but the shortest, quickest and most popular route is from the southeast via the Monadnock State Park headquarters off NH Route 124 (map). You enter the state park, walk past the Visitor Center, and start up the mountain on the White Dot Trail, marked by signs, white dots on stones and, above tree level, by cairns (piles of stones), which are especially useful in winter when the white dots may be covered by snow. Typical portion of White Dot Trail: broken rock. After less than a half hour's walk, the White Cross Trail branches to the left (west) from the White Dot Trail. The White Cross Trail is marked by white crosses on rocks. The White Cross is said to be less steep in places than the White Dot, but in fact both have steep places, and both are very rocky. The difference seems to come in the lesser number of steep rock faces on the White Cross (although there are still a few). The two trails meet again above tree line and continue to the summit as the White Dot Trail. Here's a warning that seems silly but is serious: be sure to descend the mountain on the same trail you ascended! Yes, it happens! 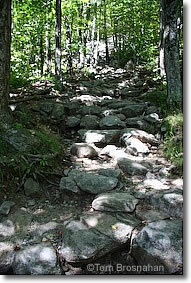 Because the mountain has numerous trails to the summit, some hikers follow one trail up, and mistakenly follow a different trail down, reaching the base on the wrong side of the mountain. If your car is on one side and you are on the other side, at sunset, miles from your car, you may have no way to return to it except hiking for hours in the dark. Click here to download a simple map of the trails (.pdf file, 2.6Mb).